The World Keeps Living. Me Too. 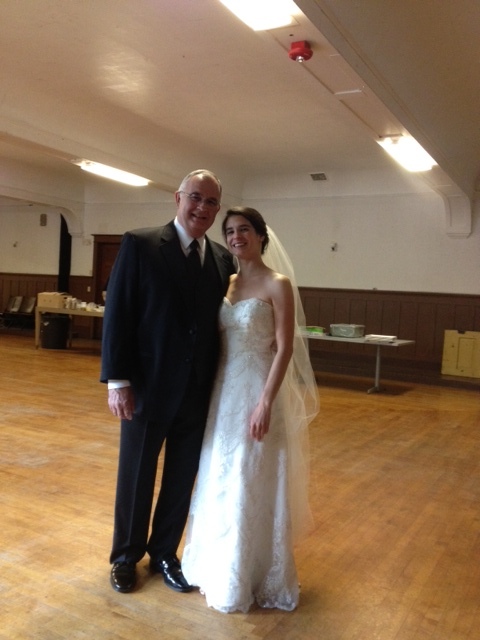 My d aughter Katy was married last Sunday, on a day the world was supposed to end. The founder of the Church of God on Earth had prophesied that the end would come on May 27, 2012. It didn’t. Katy and Derek didn’t believe him, and their wedding on May 27 was a profoundly joyful celebration of life, friendship, community, and love. Looking back over the past year, I am glad I am still alive and could attend Katy’s wedding. A year ago it was iffy whether I would be here now and in shape for a party. I had my own significant issues about when my time in this world would end. And the forecast wasn’t good. Now things look better. I remain my doctor’s remarkable patient, and chances have improved that I may still be around in 5 years or more. Apparently it is not easy to prophesy accurately the end of a life or the end of the world. I am sure the wedding guests wondered where I was going with that scripture for a wedding meditation. But it worked. I pointed out that “eating and drinking, marrying and giving in marriage” was exactly what we were doing that evening, on a day predicted to be the end of the world. And that Jesus was not condemning those activities, but rather warning not to live our lives unaware and making assumptions that we still have all the time in the world. The rest of my meditation was about how we can eat and drink together sacramentally. And how marrying and giving ourselves in marriage is about living with commitment to unselfish love…which is also a sacramental way to live. When I was first struggling with my brain cancer diagnosis and the probability of a suddenly shortened life, I remember thinking that in some ways going to heaven now instead of later would be a good thing. I have always had a vivid imagination about heaven, based hopefully on hints in scripture. Going there will be a good thing; so going there now instead of later could be considered a good thing too. In fact when my prognosis began to improve significantly, one of my feelings was relief that I would have more time here; but another was disappointment that my experience of heaven might be delayed. I resolved that dilemma the way the Apostle Paul did, deciding that if I have the choice, I prefer to remain here in this world to be with the people I love who are here, and to complete the work I believe God is still giving me to do. Being at Katy’s wedding was a strong affirmation that I am right about the first reason for staying. What an amazing gathering of friends and family! What a special occasion! What a special daughter, among three special daughters who all shone in their own unique ways at Katy’s wedding. Don’t you just love strong women? (The world doesn’t, by the way, love strong women. We have to fix that. But that is another story for another time.) I am so glad I didn’t miss Katy’s wedding. I am also feeling affirmed about the second reason for remaining in this world—to finish the work God has given me to do. My work as president of the online international theological school, Union University of California, has become more and more meaningful to me. I know that good theological thinking helps people, and bad theological thinking does great harm. It seems a great privilege to me that I can spend some of my last years in this world working to spread good theology in the world. My encouragement to Katy and Derek on their wedding day, a day that the world did not end, was to keep learning together how to live life with greater awareness, thoughtfully, selflessly, sacramentally, committed to both giving and receiving, so that through their life together the world might become a better place. As I reflect about what I have learned in this year of living with brain cancer, I think I summarized it in the wedding meditation on a day the world was supposed to end but didn’t. Live with awareness. Don’t assume you have all the time in the world. Commit to living in love for others above all else. It is the most important thing. Jesus said that people who are found doing these things when he returns will be blessed people, which means they will be happy people. And whether I go to him before he comes, or whether he comes to us before I die, I want to be able to say that I loved the people I was with in this world, and I did as well as I could what he gave me to do. Just read your blog, nice to get an update. So happy for you and your family during this celebration time. Pray and think of you often. I have multiple friends and family that are in the various stage of fighting cancer so my list has become long…..Praise the Lord for your contined good health..my best to Jinny.